In September 2015 World Leaders committed to the Global Goals for Sustainable Development. 17 goals to achieve 3 extraordinary things in the next 15 years. End extreme poverty. Fight inequality and injustice. Fix climate change. The resources at the World's Largest Challenge website will provide extra material to help you with your project. 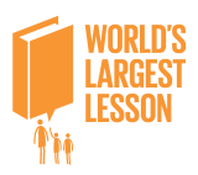 On each of the Goal pages there is a tab with a link to the World's Largest Lesson resources (see above tab).